Generate or prepare C# Corner Statistics Data based on available information on the C# Corner website. The data is generated in the JSON format. 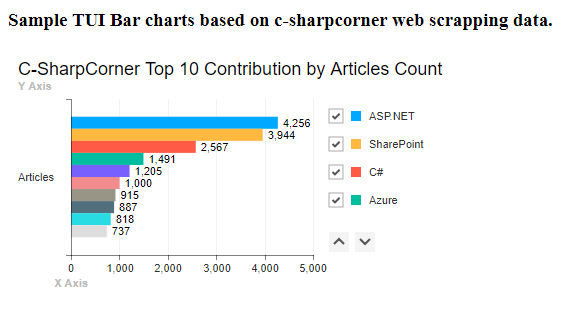 In this article, we will learn how to prepare the chart data from raw JSON from C# Corner statistics data and draw a chart using the Toast UI(TUI) Charts Library. In the previous article, we have learned how to grab or generate C# Corner statistics using web scraping with the help of cheerio.js. Let's start Step by step to draw charts using Toast UI(TUI) Charts Library. What does Wikipedia say about lodash? To generate the data for any chart, we have to make some manipulation (Conversion) on raw JSON data before passing that data to a chart. Using lodash utility function, it will be easy to generate the chart's series data for any Chart Library. Step 2 Add the required HTML controls or selectors for charts. From Web scraping data from c-sharp corner website, we found total 152 Technology categories and for that Big, JSON Data is generated. For this article, I have grabbed the top 10 technology categories based on their article count. So, this JSON data is our raw data for preparing the meaningful visualization charts. Step 3 Code snippet get top 10 technology categories based on article count using Lodash.js from Big JSON Data. Reference or add sample JSON data using script tag as below. Reference this JSON object to the page before drawing any charts so it is available before use. visible: false // Hide export option in charts its default is true. In this article, we learned how to draw charts and generate charts data from any raw JSON data using lodash js and Toast UI Charts. I hope you liked it.